There has been no contract between the Communication Workers of American union and AT&T for nearly a year as contract negotiations continue while the previous contract is on a 72 hour rolling cycle. This is the first major strike at AT&T for several years, but follows a 44 day strike last year at Verizon by over 30,000 workers during which there were several allegations of sabotage. At the moment there was no end date to the strike. 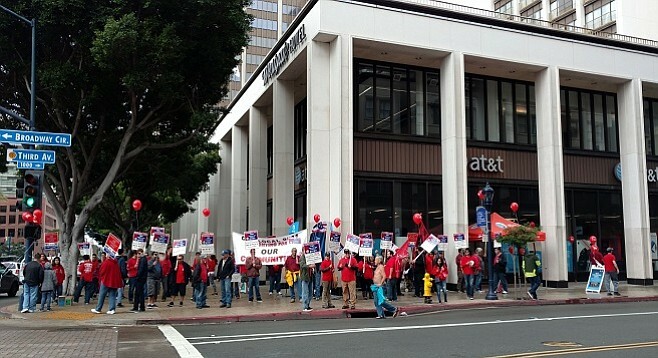 "All AT&T West District 9 Locals in CA and NV are on a grievance strike over the company's violations of the previously negotiated job duties of the Premises technicians. This same issue has been a subject at the bargaining table for months and the Company has recently made a unilateral change in job requirements without the agreement of the Union. The Union has tried to resolve this issue with the Company over several days. Locals will continue to be on strike until a satisfactory settlement can be reached. Members are advised to call their Local union for instructions. AT&T's greed continues to hurt worker and customers." "Attention!! All Local ..... AT&T Core Contract Members in all titles. There is a settlement to our grievance Strike. THE GRIEVANCE STRIKE IS OVER!" Thanks for this. As far as I know, this hasn't been covered in the mainstream British media at all, so keep the updates coming. Communications Workers of America (CWA) said that 17,000 AT&T wireline technicians and call center employees in California and Nevada will return to work Thursday after walking off the job Wednesday morning in protest of the company’s actions. As part of an agreement settled late Wednesday night between the CWA and AT&T management, the company will no longer require technicians to perform work assignments outside of their expertise and classification. AT&T also confirmed the end of the short strike in an e-mail to FierceTelecom. “The brief grievance strike has been resolved and employees are returning to work today,” an AT&T spokesman said in a statement to FierceTelecom. On Wednesday, workers at AT&T call centers and offices throughout California and Nevada picketed at dozens of locations across the two states with major picket lines in Los Angeles, Reno, Fresno, Sacramento, Bakersfield, Carson City, Tustin, San Diego and San Francisco. Negotiations for a new contract that covers 17,000 AT&T landline and broadband workers in California and Nevada continue. In related news, AT&T said on its union negotiation site that AT&T Midwest will begin early negotiations this week with the International Brotherhood of Electrical Workers (IBEW) System Council T-3 for a contract covering nearly 5,000 wireline employees located primarily in Illinois and northwestern Indiana. The IBEW employees covered under the contract are members of IBEW Local 21 in Illinois and northwestern Indiana, and of other IBEW locals spread across the country. The contract expires on June 24, 2017. These negotiations are expected to cover wages, benefits, pension and work rules.